Luxury Airpod Case for Airpods with Clip Holder. These Airpod Case Holder has easy access for Charging your Case. 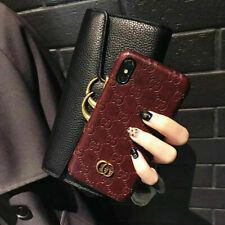 Red GG non authentic style fashion leather phone case For iPhone x/xs. Condition is Used. Shipped with USPS First Class Package. Luxury Phone Case For iPhone XR XS Max 6S 7 Mirror Plating Tempered Glass Cover. Condition is New. Shipped with USPS First Class Package. GUCCI COSTUDIA I PHONE 4G SILICONE M CASE, MATTE BLACK RUBBER MONOGRAM GG, MADE IN ITALY 272401 JI400 1000, NEW IN BOX. Unique Features : Guccissima GG Case for iPhone 6 Plus. Designer: Gucci. Gucci iPhone 6 Plus / 6S Plus Case. Originally $350.00. Condition is used and in excellent condition. Comes with accompanying gift box. Shipped with USPS First Class Package. GUCCI COURRIER SO COOL!!! 100 % Authentic IPhone 8 Plus CASE ~~ Very Gently Used~~Original GG motif with a blend of contemporary vintage inspired embroidered patches... Comes with All Original Packaging and Box. Purchased directly from Gucci’s website. There is some light lifting on two of the corners ~~ this can easily be reinforced... Retail : $380.00 Please email with any questions!! Thanks! Style : 399029. Color/Material : Violet 5235 / Rubber. Surface has Tiny Dirt, Tiny Cracked, Tiny Chipped. (1) Designed for Apple iPhone. Slim & Lightweight. This sleek case is constructed from durable PC TPU material. 6)Matte finish surface. 5)Back case only, without front cover. We will work to resolve your concerns. Also included is the original storage or gift box. It’s solid black bioplastic with the signature Guccissima pattern. I will not respond. Because I list quickly if there is any information you would like other than what is listed I will be glad to provide it.